Move all your pieces to your goal in a nest. 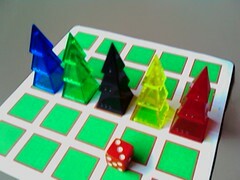 Each player picks a color and places their three pieces in a tree at opposite ends of the 5x1 board (or the center row of a Volcano board) with the remaining pyramids in three trees in each of the three remaining squares. We'll call these remaining pieces pedestrians. The person with the stinkiest feet goes first. On your turn, roll the six sided die. The number on the die indicates how many movement points you have. 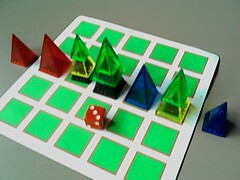 Your objective is to move all of your pieces into your goal location into a nest formation. Your goal location is located off the board opposite the side you started. 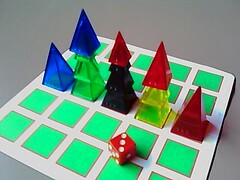 The piece's pip count indicates how many movement points is required to move that piece one space. You may move any number of pieces any number of spaces in either direction as long as you have sufficient movement points. Your combination of moves MUST make use of all your movement points. You may move your pieces and/or the pedestrians, but not your opponent's pieces. 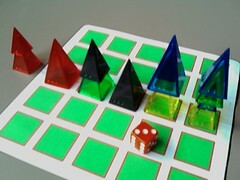 You may only move the topmost pyramid on a stack. 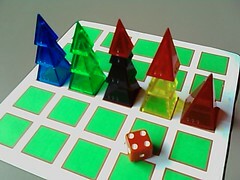 Your pieces may not land on or step over any of your opponents pieces, but the pedestrians may. 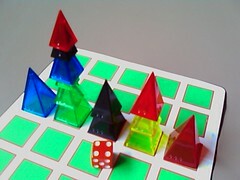 You may move your pieces, but not the pedestrians, on and off the board into your goal location. 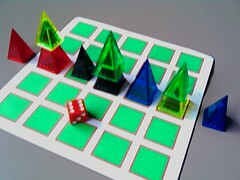 If you cannot make any valid move, you may take any top most pyramid but your own and move it to any location on the board. Bury your opponent's pieces. Since your opponent may not move your pieces, an easy way to limit their moves is to place one of your pieces on top of theirs (with a pedestrian between the two, of course). But be careful not to limit your opponent too much or they may just get to move your piece back to the start. Keep pedestrians away from your pieces to limit your opponent's opportunities to pin you. 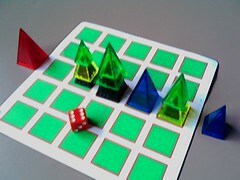 Player 1 chose Red and places his pyramids in a tree on the right. 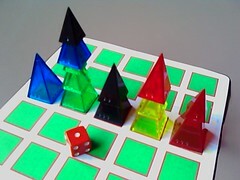 Player 2 chose Blue and places her pyramids in a tree on the left. The remaining green, black and yellow pedestrian trees are placed in the three middle spaces. Red rolls first with a four. He moves his pawn two spaces left and his drone one space left. Blue rolls a three and moves her pawn one space to the right and then her drone one space to the right on top of her pawn. Red rolls a four. Since his path to the left is blocked by Blue's pieces, Red decides to move his pawn back one space to the right to free up the black pawn. Red then moves the black pawn one space left on top of Blue's piece so he can then move his pawn two spaces to the left. Blue's pawn and drone are now trapped under Red's pawn. Blue rolls a one. Oops! Red didn't foresee this. Since Blue can't make any valid moves, she gets to move any topmost piece other than her own anywhere on the board. She decides to move Red's pawn all the way back to Red's starting space unpinning her pawn and drone. Bummer for Red! Red rolls a three. Argh! His drone and pawn are stacked the wrong way. He'll have to move them both out so he can move his pawn back in first. Blue rolls a three. She could move her queen one space to the right, but since Red only needs a roll of three to win, she decides to bog down Red a bit hoping she can make a better roll next turn. She moves the green pawn and yellow drone on top of Red's queen. But then Red rolls a six. And moves the green pawn and yellow drone off to the right and his queen into his goal to win the game! This page was last modified on 18 February 2017, at 18:22.